Heavy clashes erupted between Palestinian youth and Israeli soldiers in the centre of Hebron, after a Jewish settler murdered a Palestinian. 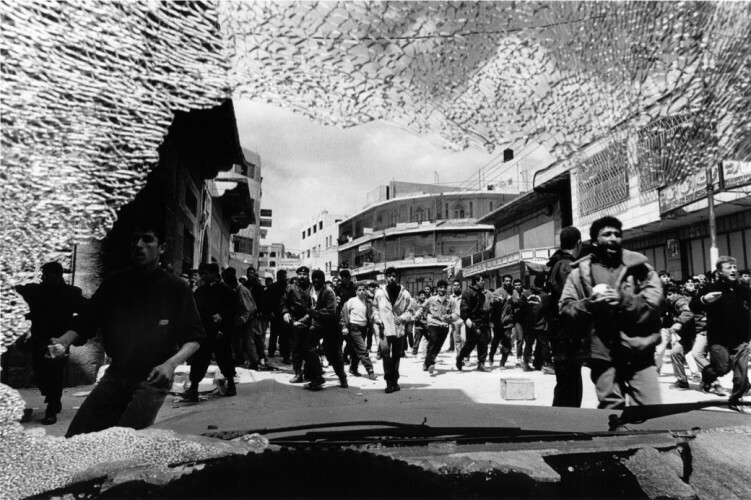 Hebron, Occupied Palestinian Territories, April 1997. An Israeli soldier on guard at the city wall of Jerusalem watching Palestinians during their national day. 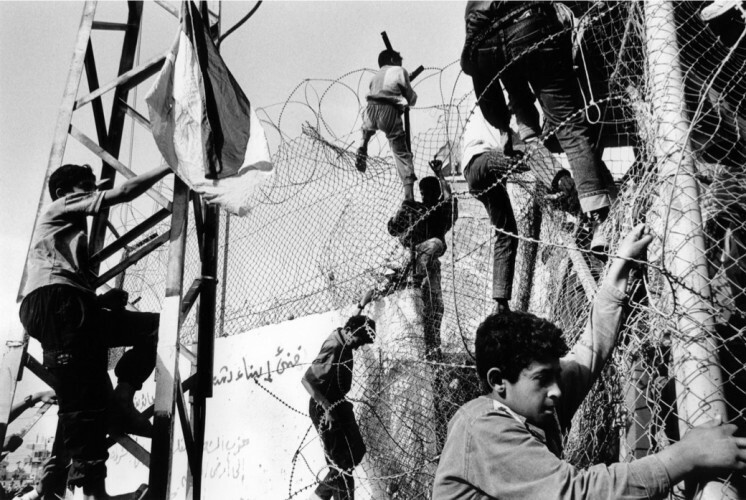 East Jerusalem, Occupied Palestinian Territories, March 1990. 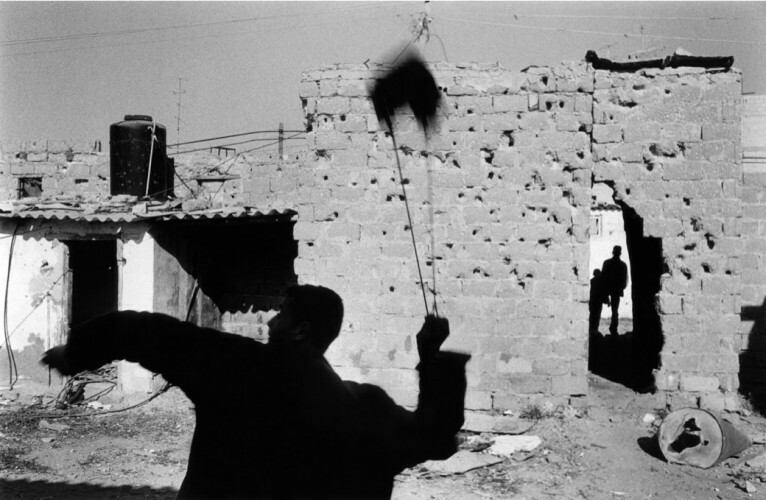 Palestinan teenager throwing a stone towards an Israeli bunker on the Israeli - Egyptian border in Rafah. The soldiers inside the bunker regulary return the fire with a mounted maschine gun. Several boys were killed in that area. Gaza Strip, Occupied Palestinian Territories, December 2000. Burial of Asem Rashid Arafe, a shop owner who was murdered by a militant Israeli settler in the center of Hebron. 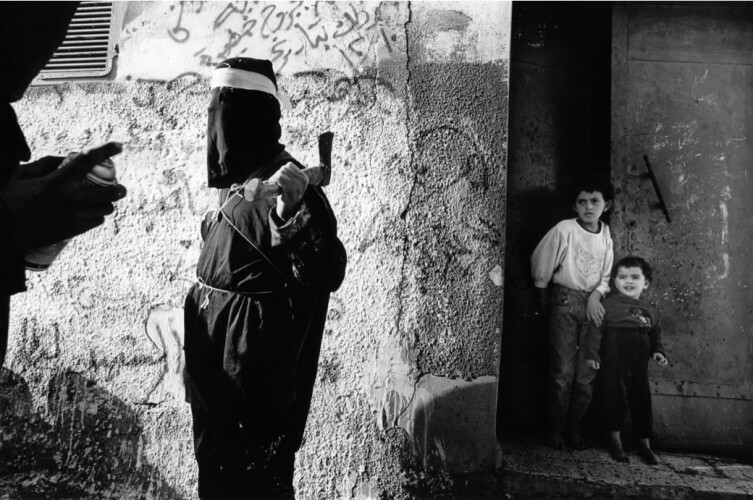 Hebron, Occupied Palestinian Territories, April 1997. Demonstration against Israeli army violence by the rejectionist groups of the Osloaccords. The same day Ariel Sharon got elected as Israeli prime minister. The transparent poster shows the ”engineer” Yahia Ajasch, who build most of the bombs for the suicide bombers of the Hamas, who blow themselves up in Tel Aviv and Jerusalem, killing dozens of Israelis. 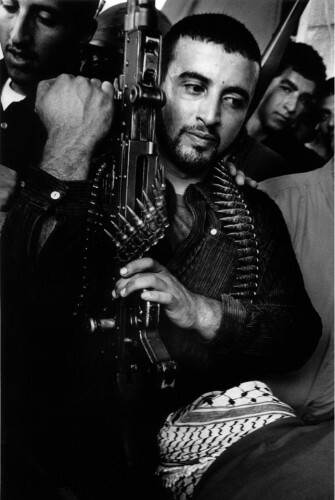 He was assasinated by the Israeli secret service in January 1996. 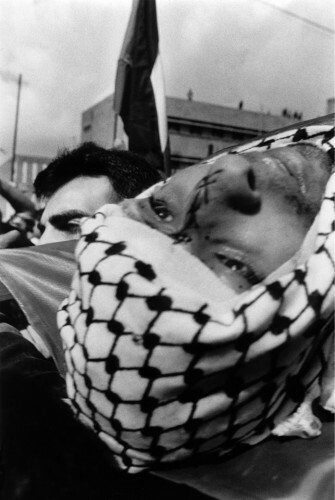 Ramallah, Occupied Palestinian Territories, February 2001. 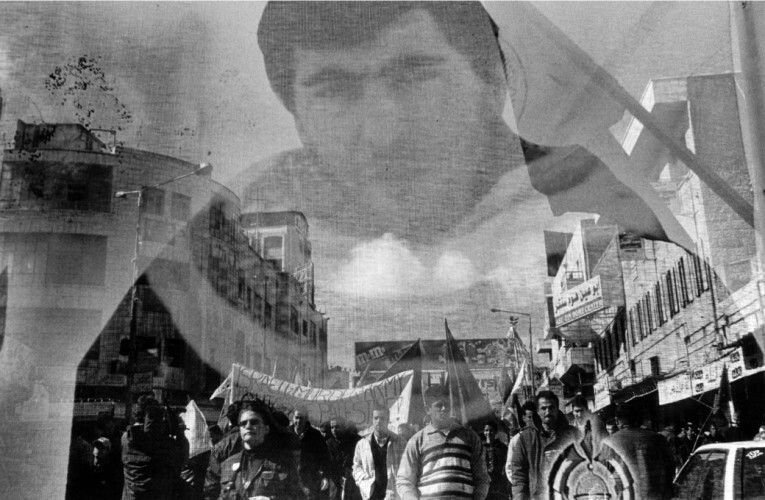 Tanzim fighter mouring his dead camerade Atef Abayat, a leader of the militia in Bethlehem who was assassinated by the Israelis. Bethlehem, Occupied Palestinian Territories, October 2001. The remains of the houses of Khan Yunis Refugee Camp which were destroyed by Israeli bulldozers, tank and rocket fire. It was located only 10m from the wall of the Israeli settlement of Neve Dekalim in the Gaza Strip. Therefore it is a place of frequent fighting. Gaza Strip, Occupied Palestinian Territories, December 2001. Scene at the beach in Gaza City after the Israeli withdrawal. 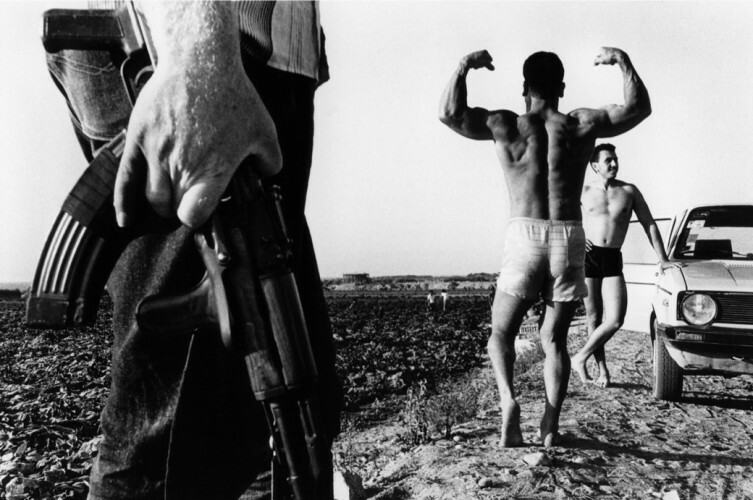 Gaza Strip, Occupied Palestinian Territories, June 1994. 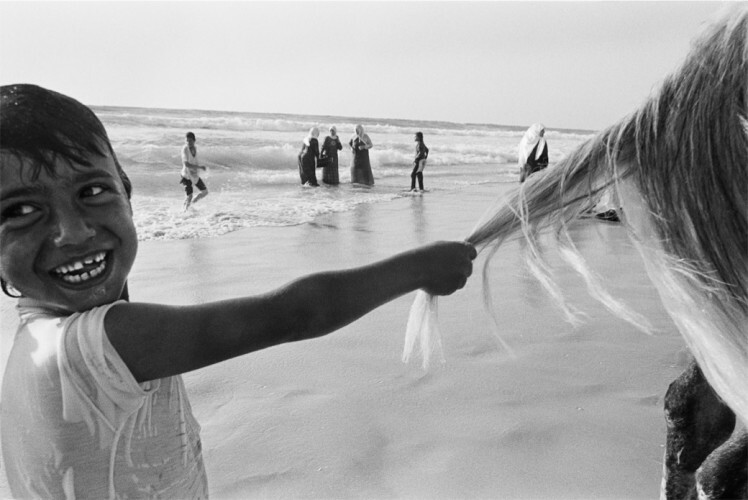 A Palestinian boy playing at the beach of Gaza City after the withdrawal of the Israel army from the city. Occupied Palestinian Territories, 1994. 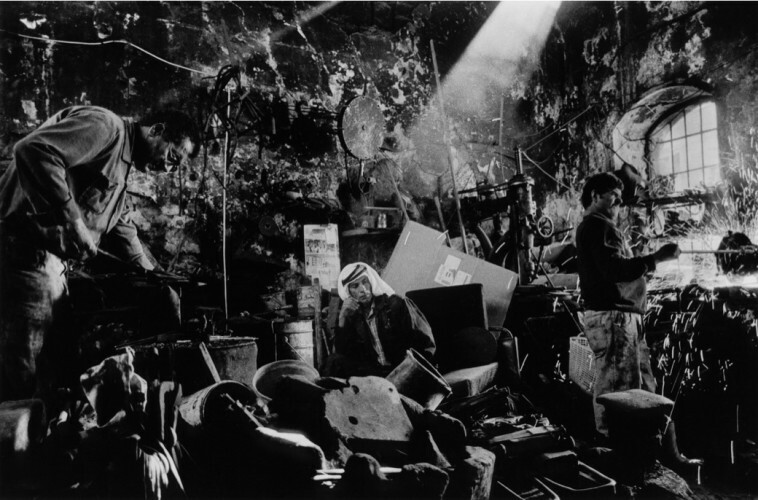 A workshop of a Palestinian blacksmith. 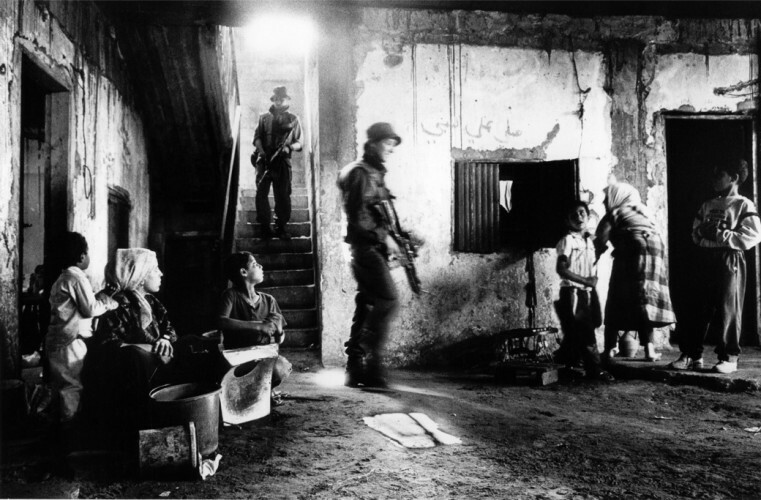 Hebron, Occupied Palestinian Territories, November 1996. 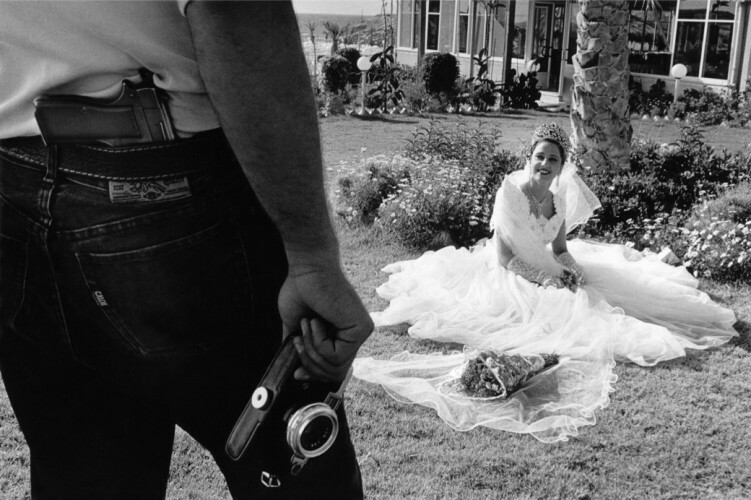 Shortly before her wedding a Palestinian bride is sitting in the park of recently opened tourist village of Gaza. One of her relatives, who is working in one of the 11 secret services of the Palestinian authority, is taking pictures of her. 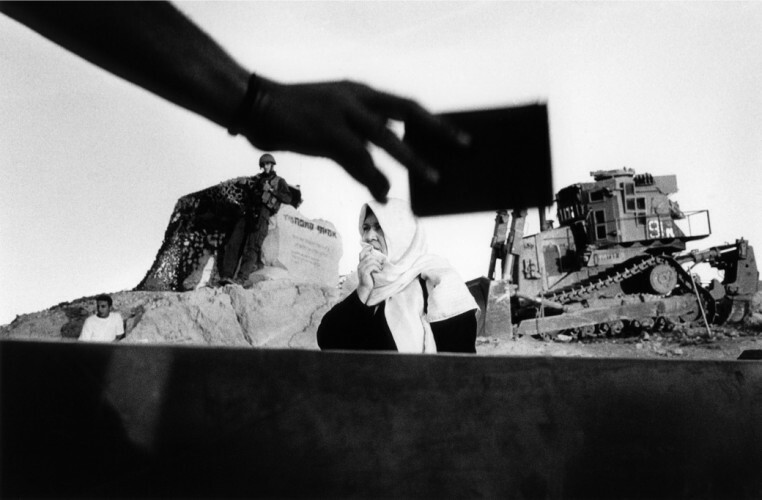 Gaza Strip, Occupied Palestinian Territories, May 1997. A boy playing with a plastic pistol in a alley of Shati Refugee Camp in Gaza City. 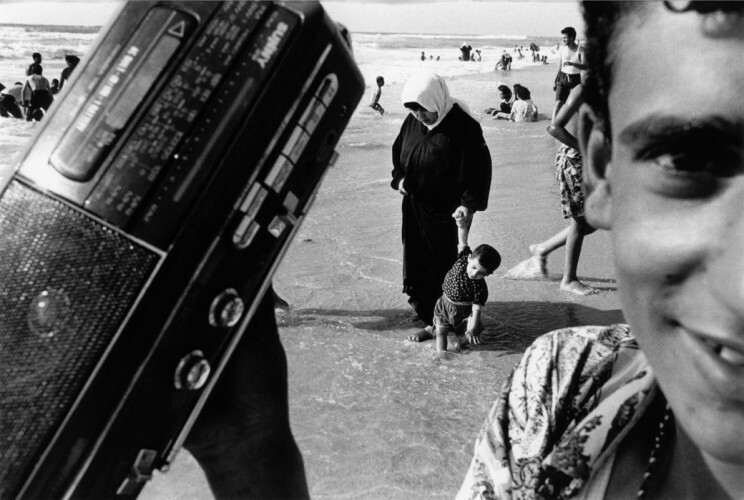 Gaza Strip, Occupied Palestinian Territories, June 1994. A Palestinian on his way from Ramallah to Jerusalem is showing his identity card to an Israeli soldier at Qalandiya checkpoint. Occupied Palestinian Territories, October 2001. 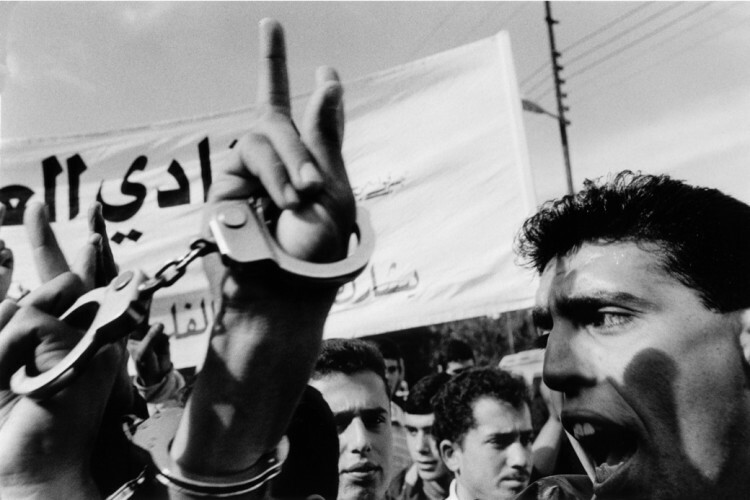 Palestinian demonstrators demanding the release of prisoners according to the Oslo Agreement. 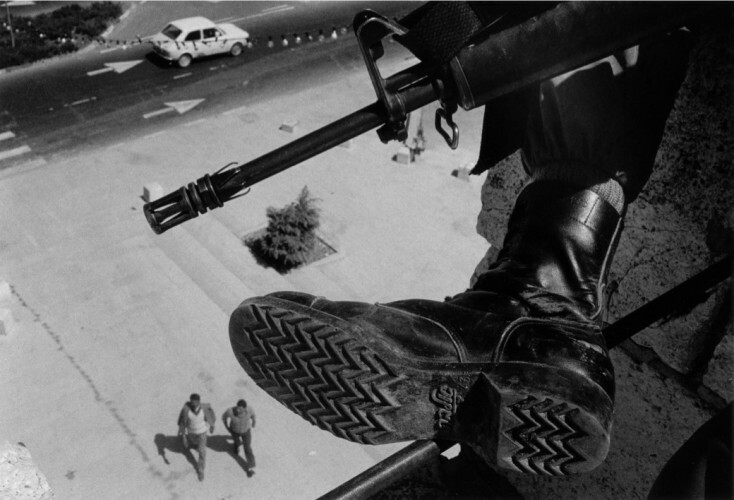 The release was delayed by the Israeli authorities for years. 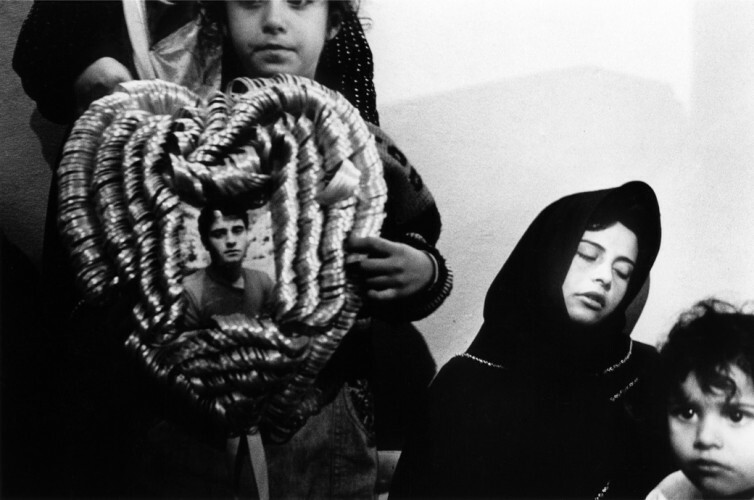 Hebron, Occupied Palestinian Territories, December 1996. First day of the arrival of the Palestinian Police Force in the Gaza Strip. The population gave them an overwhelming welcome at the police station of Deir al-Balah. 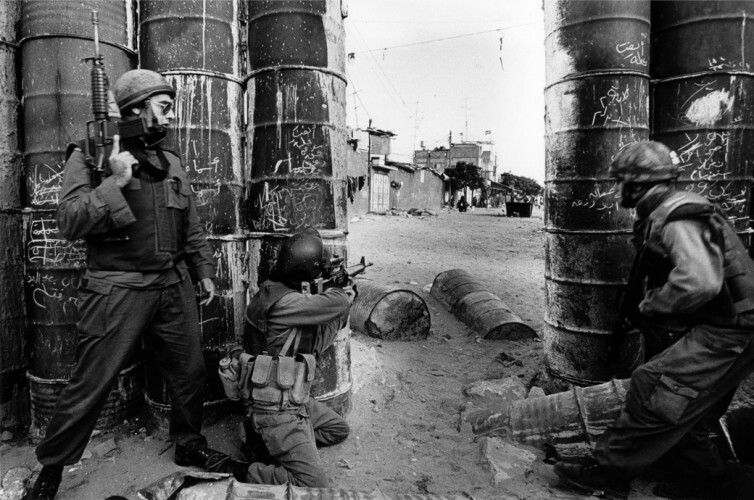 Gaza Strip, Occupied Palestinian Territories, May 1994. Israeli police protecting a house in the Moslem quarter of the old town of Jerusalem. It was occupied by right-wing settlers the night before. The sheikh in the foreground made a formal, but useless protest to the police. He encouraged the Palestinians in the second floor not to leave their house though the staircase was blocked by the settlers. If they wanted to leave their home, they had to walk over the roofs of the old town. East Jerusalem, Occupied Palestinian Territories, May 1998. Hamas supporters the opponents of the Oslo Agreement spraying graffiti in the Tuffah neighbourhood. 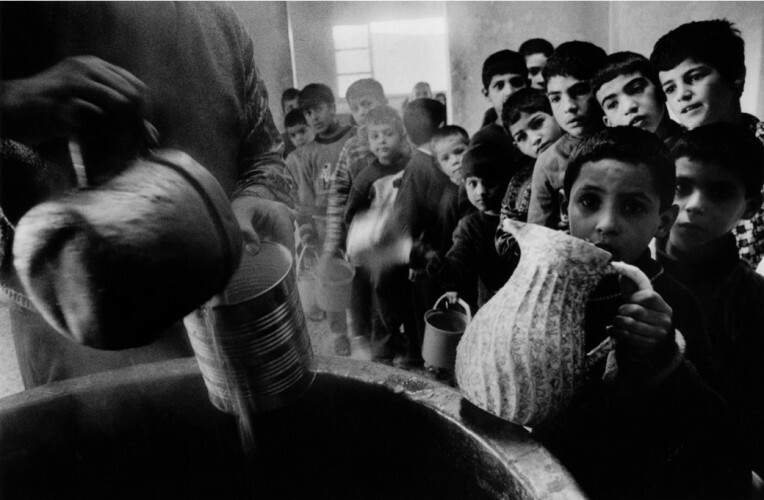 Gaza City, Occupied Palestinian Territories, December 1993. Funeral of Achmed Marschud, 29 an activist of the Hamas in Balata Refugeecamp near Nablus. He was blown up by the Israeli secret service. 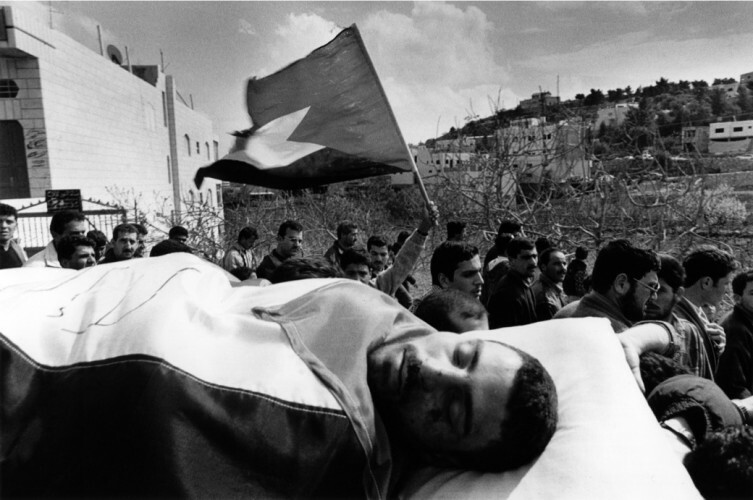 Nablus, Occupied Palestinian Territories, October 2001. A widow and her children mourning their killed father, a former activist in the armed resistance in the neighbourhood of Sheik Radwan. 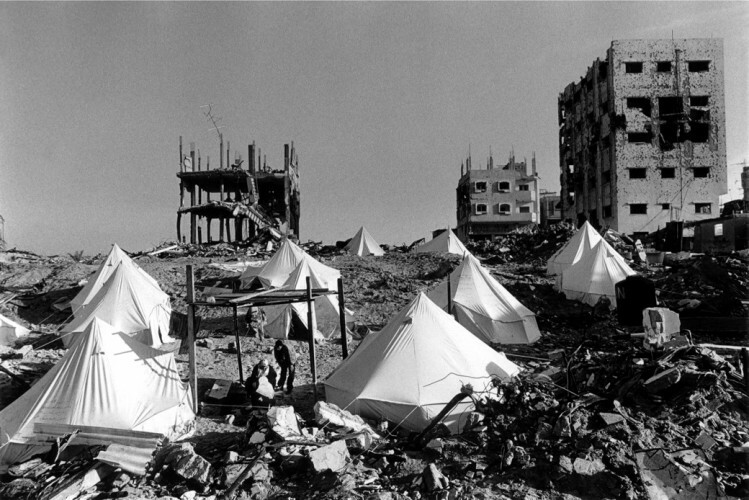 Gaza City, Occupied Palestinian Territories, November 1993. A Hamas member waiting in front of the morgue of a hospital in Nablus to receive the body of Achmed Marschud an activist of his organisation, who was assassinated by the Israeli secret service. 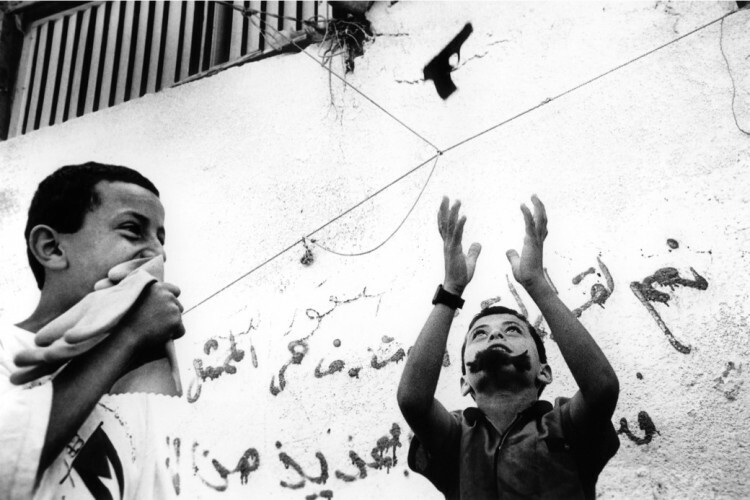 Nablus, Occupied Palestinian Territories, October 2001. Palestinians visiting their friend who is on duty as a secret serviceman at a checkpoint outside Gaza City. Occupied Palestinian Territories, June 1994. 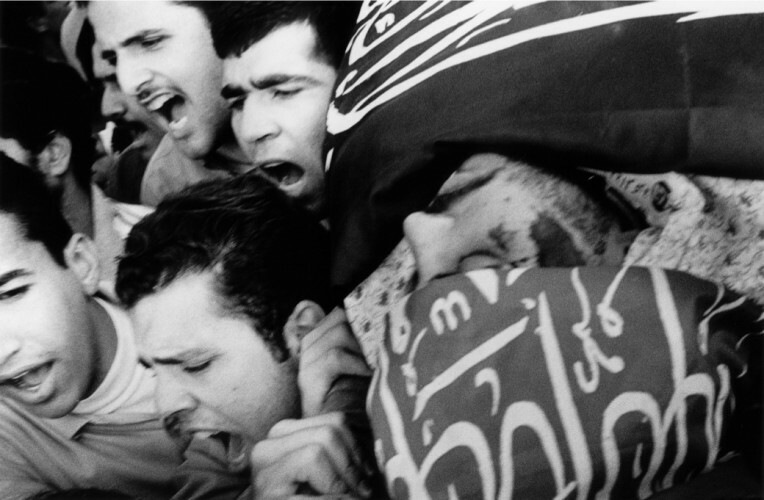 Adnan Duwayqat, 20, is carried to the cemetery. During a clash he was shoot in the head by a 12,7mm maschine gun from a tank which was a kilometer away from the clash site. 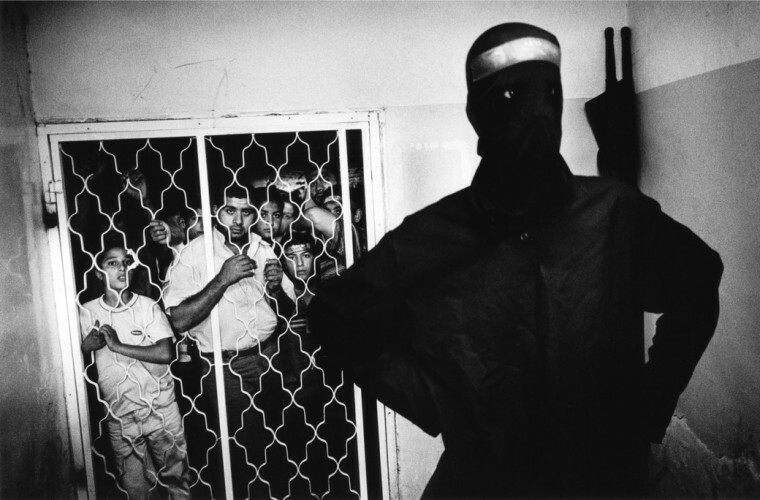 Nablus, Occupied Palestinian Territories, September 2000.
in the Israeli-occupied territories. He has learnt the Arabic language, taken a close look at the Middle East, and thoroughly tried to understand the mentality of its inhabitants. 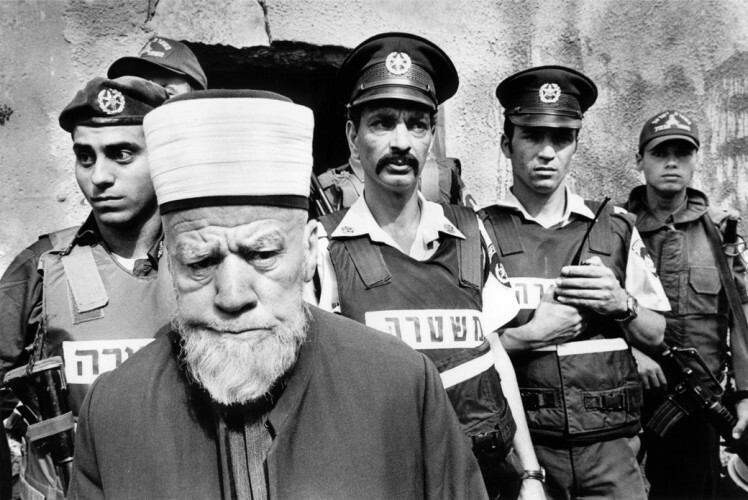 It wasn‘t long before the Palestinians called him Habib al-Schaab, friend of the people. They opened up toward him, and allowed him to gain an insight into a world, which generally is reported about in stereotypes. Kai Wiedenhöfer‘s photographs live on his closeness toward the human beings depicted. They are telling about the everyday life of children, women and men, the victims and warriors of the Intifada, the dogged fight against the occupation. Perfect Peace expresses the hopes and disappointments in a region which only will be finding peace through mutual understanding.